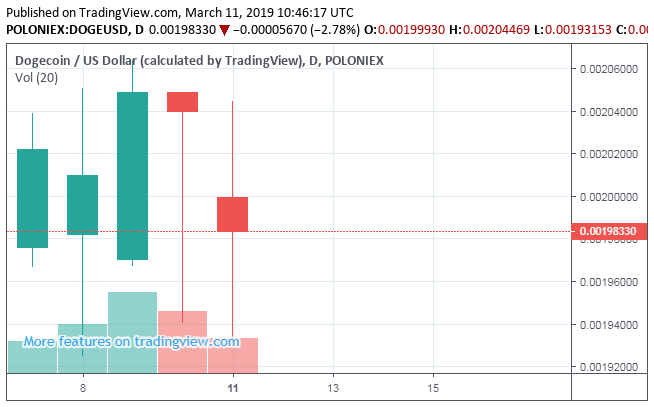 Dogecoin (CURRENCY: DOGE) traded up 0.2% against the dollar during the 1-day period ending at 21:00 PM Eastern on March 3rd. 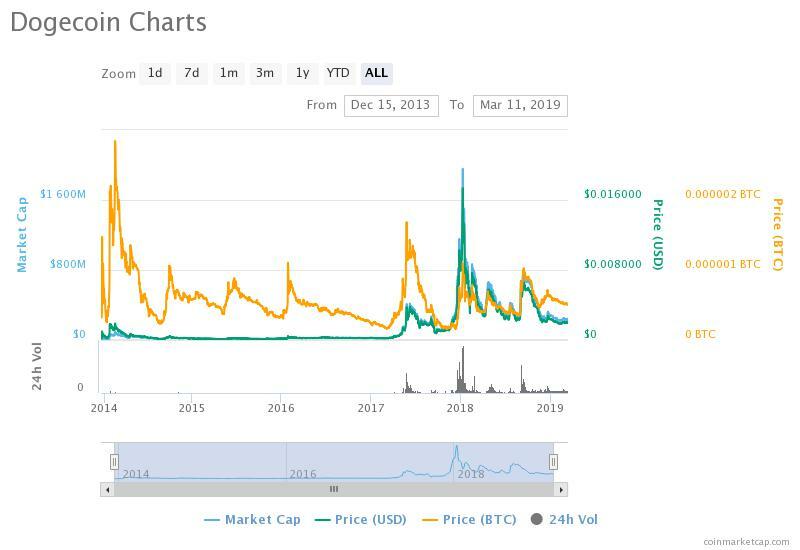 Dogecoin has a market capitalization of $237.30 million and $14.16 million worth of Dogecoin was traded on exchanges in the last day. One Dogecoin coin can currently be purchased for approximately $0.0020 or 0.00000051 BTC on major cryptocurrency exchanges including Bleutrade, Bittrex, CoinFalcon, and Cryptopia. In the last seven days, Dogecoin has traded down 0% against the dollar. Dogecoin is a proof-of-work (PoW) coin that uses the Scrypt hashing algorithm. Its genesis date was December 6th, 2013. Dogecoin’s total supply is 118,598,724,372 coins. Dogecoin can be traded on the following cryptocurrency exchanges: Coinsquare, YoBit, CoinEx, CoinFalcon, HitBTC, CoinExchange, ZB.COM, Stocks. Exchange, BtcTrade.im, Bits Blockchain, FreiExchange, Poloniex, Instant Bitex, Bitbns, Indodax, Tripe Dice Exchange, Bit-Z, QBTC, cfinex, BX Thailand, Bleutrade, Tux Exchange, Bitsane, BiteBTC, Fatbtc, Upbit, Kraken, Cryptopia, Trade Satoshi, Crex24, Tidex, Cryptohub, BitFlip, Mercatox, Exrates, and OpenLedger DEX. 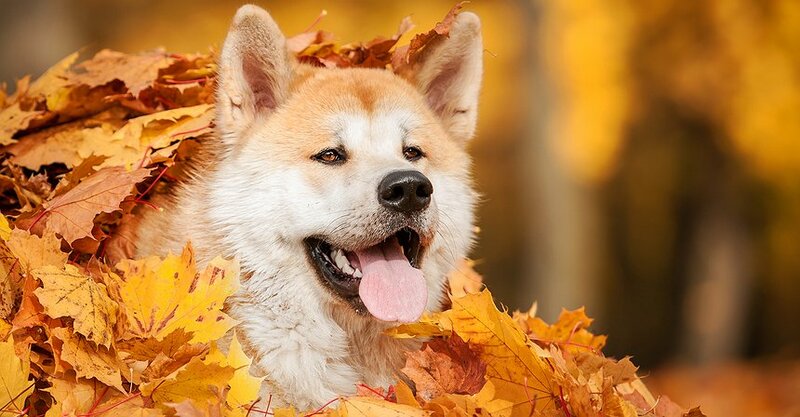 It is usually not presently possible to purchase alternative cryptocurrencies such as Dogecoin directly using US dollars. Investors seeking to trade Dogecoin should first purchase Ethereum or Bitcoin using an exchange that deals in US dollars such as Coinbase, Changelly or Gemini. Investors can then use their newly-acquired Ethereum or Bitcoin to purchase Dogecoin using one of the aforementioned exchanges.